Head between Hand is the first wearable art project created by Francesco Arena. 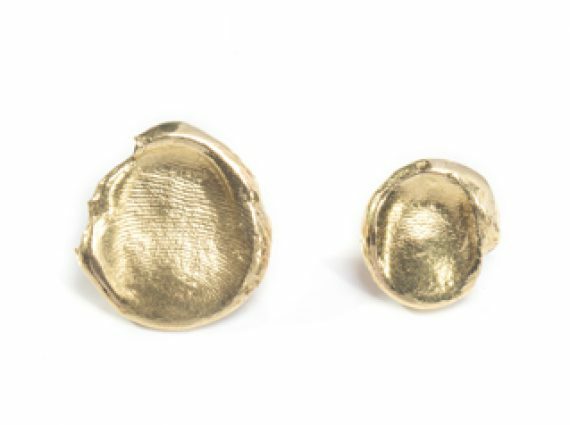 The two earrings are cast of the artist’s thumb and little finger. A new born baby typically expands his hand with the aim to grab anything that surrounds him. This gesture symbolises his will to live and experience what is around him. This gesture has not changed for the artist, not even in his adult age, as he keeps on opening his hand to grasp what he wants and what he needs. Thumb and little finger get apart from each other to greet or to intimidate, to touch or to grab. The two artist’s fingers will hold the wearer’s head who will keep on bringing the artist’s hand around to experience anything the wearer lives.